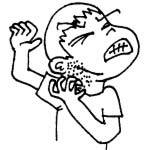 Itchy Skin All Over - How to Stop Itching? If itchy skin all over is due to an underlying health condition, the obvious cure would be to seek treatment for such a health condition in order to diminish the side effects of itching. For instance, an itchy rash on chest may be caused by anxiety, which is treatable through medication and therapy. If the anxiety is addressed, the rash may be diminished as well. Diabetes can also produce rash on face, legs and arms resulting from high blood sugar that damages blood vessels over time. Stabilizing blood sugar levels will have a positive effect on the condition of the skin. Then again, a rash on the chest can be a dermatological condition similar to dermatitis or Pityriasis Rosea, a psoriasis-like skin disorder. When itchy skin all over is present with itchy bumps on skin, a dermatologist can determine the best method of resolving such an annoyance. Hydrocortisone cream along with antihistamine or steroid medications are often prescribed to relieve this condition. When an insect bite rash causes itchy skin all over, an antihistamine may be suggested, as well as a hydrocortisone cream for topical application to provide itching relief. Antihistamine is a widely recommended over the counter medication that is mostly beneficial for rashes due to allergic reactions to detergents, body soaps, and more. Have you started taking a new medication? Whether it’s an over the counter or prescription, hives and itchy skin could be a symptom of an adverse reaction to this medication. Consulting your doctor will help you determine whether another medication may be in order to eliminate these symptoms. A dermatologist should be seen to determine the course of treatment when skin rashes and itching are not resolved by other measures. Whether it’s an allergic reaction to your new body lotion or a prescription medication, exacerbation of chronic eczema or psoriasis, your doctor will help you find the cause of your itchy skin.